Tachyon is a member of space mercenary team Force. These appeared in two Guardians of the Galaxy story arcs in 1990-91. Force is a bit like a less heroic — but not really villainous — version of the 1990s Guardians. Height: 3’8” Weight: 0 lbs. Tachyon is an entity composed entirely of tachyon particles, which seems to have a humanoid form. It can reflect any energy-based attacks directed at it, increasing their power as it does so. But it can not otherwise affect its foes. Its powers are purely reactive, so it cannot attack its enemies unless they attack it, or its allies, first. 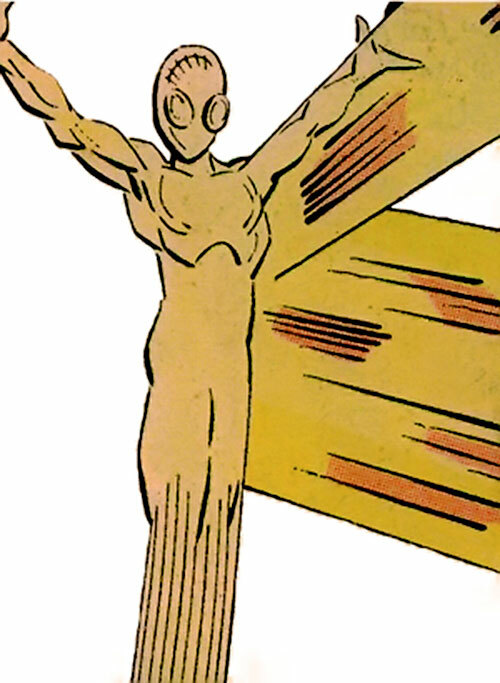 It can also fly at above the speed of light, and gave Interface his powers. But it’s uncertain whether Tachyon brought out dormant powers that Interface already had, but was unaware of. The Tachyon entity appeared to Interface as he slaved away for the Universal Church of Truth. It empowered Interface, and helped him escape. It continued to travel with him as he formed the mercenary group, Force. When Interface learned of a sacred shield which supposedly bestowed great power on its wielder, he led Force on a search for the shield. They eventually tracked it down to a planet. The computer that ran this world, Main Frame, forced them to compete against another team that had been searching for the shield, the Guardians of the Galaxy. Tachyon faced Starhawk. Tachyon had the upper hand initially, but Starhawk soon realised that Tachyon’s powers were reactive, and so he refrained from acting, thereby winning. With the other contests resulting in draws, the final contest came down to Interface versus Vance Astro. Interface easily subdued Astro. But when he seized the shield, he didnt understand that its “power” was symbolic. Therefore was so caught up in trying to access the power that Astro managed to take it away from him. Losing due to his motives rather than the contest, Interface, Force, and their ship were teleported 15 parsecs away by Mainframe. Seeing no benefit in returning to challenge Mainframe or the Guardians, Interface ordered them to move on to other possibilities. When Force were attacked by Malevolence, their resistance was easily dispatched. The one exception was Brahl, who happily made a deal with Malevolence. She declared them her slaves, using her power to keep them in line, and assigning Brahl as their new leader. Malevolence led them to Homeworld, centre of the Universal Church of Truth. There she challenged for the role of matriarch to Protégé. When Malevolence sensed the Guardians, with her main rival, Aleta, approaching, she dispatched Force to delay them. Force attack the Guardians on board their vessel, until Martinex convinces Interface to call a truce. Brahl flees to tell Malevolence of their treachery. Joining forces, Force and the Guardians traveled to Homeworld to confront Malevolence. She convinced Protégé that they were coming to harm him. So he dispatched his elite guards, forcing the invaders to use their powers in his presence. The battle was stopped when Starhawk reabsorbed Aleta and left, allowing Malevolence to win by default. 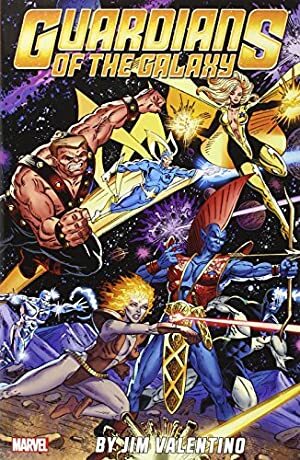 Force and the Guardians were spared when the Guardian, Replica, herself a Universalite, begged Protégé for their lives. He acceded, banishing them from Homeworld. Force left, looking for new opportunities for profit. Tachyon seems to be primarily a passive observer of events, his powers only reacting to others. Due to his inability, or unwillingness to communicate with others, it’s difficult to determine his true motivation, but he does seem to have befriended, or at least follows, Interface. Force have clashed with the Legion of Super Heroes on a couple of occasions, most recently when Brahl manoeuvred them into fighting as part of a plan to gain revenge on Phantom Girl. He was expelled from the group as a result. Bestow is Serious Marginal (-2). Power Reserve only adds to the APs of a Reflected attack (-1). Reflection/Deflection only affects energy attacks (-1). Self-Link (Flash) is Always on (-1). Source of Character: Guardians of the Galaxy, Marvel Comics . Helper(s): Gamers Handbook of the Marvel Universe.